A nice account of the recovery and history of this important marble bust of John Brown by the New England sculptor Edward (sometimes identified as Edwin) Brackett. He was Edmonia Lewis’s teacher in Boston. His influence on her work is particularly notable in her own heroic busts of figures such as Henry Wadsworth Longfellow, among others. Went with my dear friend Ellen to Barbara Chase-Riboud’s show and book signing at the Michael Rosenfeld Gallery in New York City. A lovely show of some of her bronze and silk work, along with a selection of drawings — including two “drawings” done in silk. 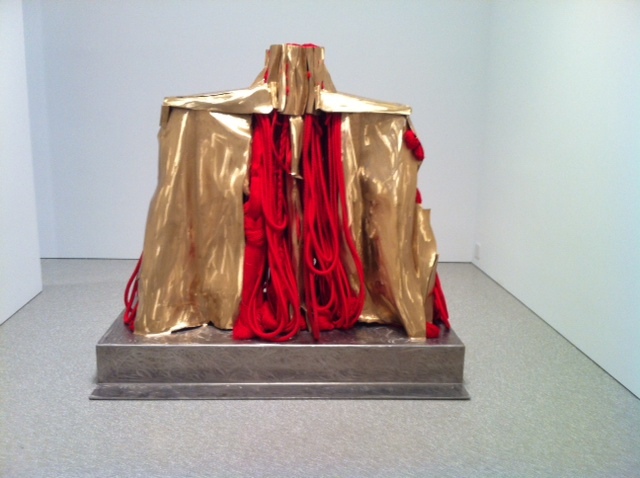 Her dark pieces are most familiar to those who have followed her work over the years, so the glowing “Mao’s Organ” (below) was particularly striking. The book signing was for her collected poetry 1974-2011, with the beautiful title Every Time a Knot is Untied, A God is Released.